On July 14th, the Agriculture Committee of the House of Representatives voted to pass the DARK Act, and it is expected to reach the House floor for a full vote during the week of July 20th! Please call the Capitol Switchboard RIGHT NOW at 1-877-796-1949 and ask to be connected with your representative (just give them your zip code). PLEASE CALL, we need their phones ringing off their hooks on this. 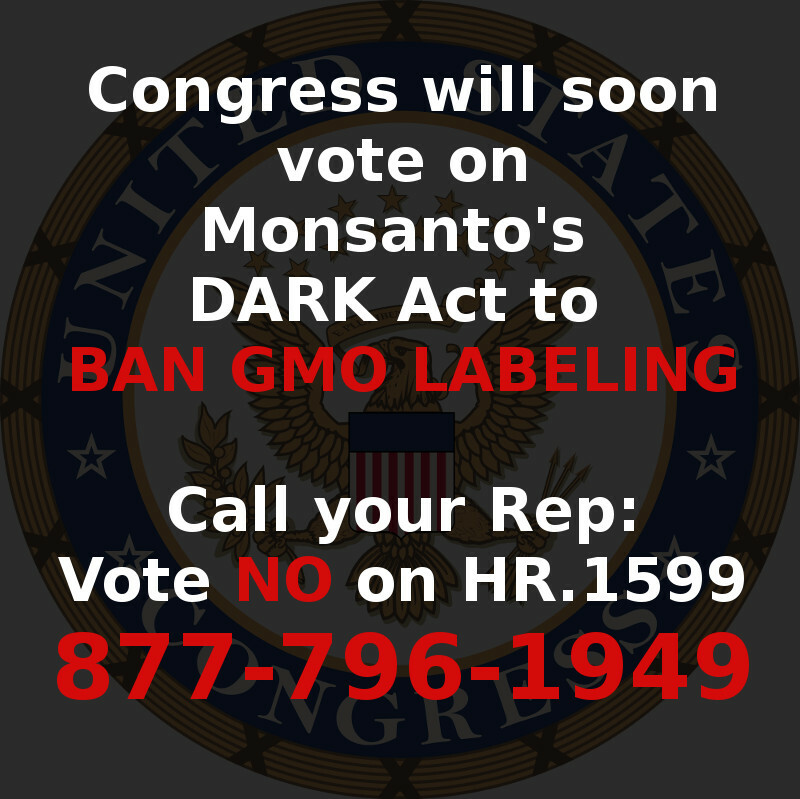 You may even go so far as to tell them you will not vote for your Representative if they support the DARK Act. Call now and call every day and encourage your friends to do the same. We need everyone and their friends, families and neighbors to contact congress right away: this could be our last chance to Stop the DARK Act! PLEASE CALL NOW and share this action alert far and wide. -Prevent food companies from suggesting that non-GMO products are better than GMO products. 3. FInd your Rep’s facebook page and leave a message there! 4. Get others to do the same! Over the past three years, over 30 states have introduced bills or ballot initiatives to require the labeling of genetically engineered (GE) foods and three states –Connecticut, Maine and Vermont– have passed mandatory GE labeling laws. Despite this massive push for GE labeling by states across the country, Congressman Mike Pompeo (R-KS) is circulating a revised draft bill that would prohibit any current or future state law requiring the labeling of GE foods while at the same time dramatically undercut the ability of states or local governments to regulate GE crops. 1. All Americans deserve to know what’s in their food. The labeling of GE foods is supported by 93% of Americans. Nearly 1.4 million Americans have joined a petition urging FDA to require labeling of GE foods. Earlier this year, 200 companies and organizations sent a letter to President Obama urging him to honor his 2007 pledge to require GE labeling. In the absence of federal leadership, states have responded by passing GE labeling laws. Congress should heed the call by consumers for mandatory labeling, not oppose it. 2. Voluntary labeling will not work. It has been over 13 years since FDA approved voluntary GE labeling, and zero companies have voluntarily disclosed the presence of GE ingredients in their products. The voluntary labeling of non-GE foods and organic foods is a marketing tool limited to only 2% of products on the shelves and is not a substitute for mandatory disclosure. The most effective way to provide consumers with the full universe of information about their foods is through mandatory labeling. By making it even harder to voluntarily disclose whether or not food is GE, the DARK Act will exacerbate consumer confusion and perpetuate consumer distrust. On April 27, 2015, the U.S. District Court for the District of Vermont issued its decision largely affirming the constitutionality of Vermont’s GE food labeling law, Act 120. FDA already requires the labeling of nearly 4,000 ingredients, additives, and processes. Labels do not depict a “skull and crossbones” as some may complain, nor are labels only required for foods that have been proven dangerous. In the U.S. we do not label unsafe foods; we take them off the market. For instance, whether orange juice is from concentrate or whether food has been irradiated are currently communicated to consumers via labels required by FDA. 4. Labeling GE foods is based on sound science, the DARK Act is not. The U.N. Codex Alimentarius has recognized that mandatory GE labeling can be a vital public health tool for physicians in being able to track unintended health effects. The DARK Act goes against this better judgment by prohibiting states and FDA from ever requiring labeling. Furthermore, the patentability of GE foods demonstrates that they are materially different from conventional foods. A product or process that is patentable cannot be both “novel” for patent purposes yet “materially similar” to existing technology for labeling purposes. 5. Companies can label GE foods without increasing food prices. According to a recent study by independent food-marketing expert Kai Robertson, changes to a food manufacturer’s product labels have not been found to affect the prices paid by shoppers. This is largely because food processors regularly make changes to the labels of their products for marketing or regulatory reasons. Many local government ordinances restricting GE crops have been in place for over a decade, in states such as California, Oregon, Washington, and Hawaii. These have passed democratically and are intended to protect farmers and communities from economic, environmental and public health risks. In May 2015, a court upheld a Jackson County, Oregon law establishing a GE-free zone. This and numerous other state and county ordinances would be voided the new language. 7. A commonsense federal labeling solution exists. Bipartisan legislation has been introduced by Rep. DeFazio and Sen. Boxer (H.R. 913/S.511) that would balance the needs of industry for a federal labeling scheme with the rights of consumers to know what they are buying and feeding their families. Rather than creating special loopholes and greater regulatory uncertainty for industry or consumers, H.R. 913/S.511 works within FDA’s existing food labeling framework and is consistent with past labeling decisions. One Response to URGENT! 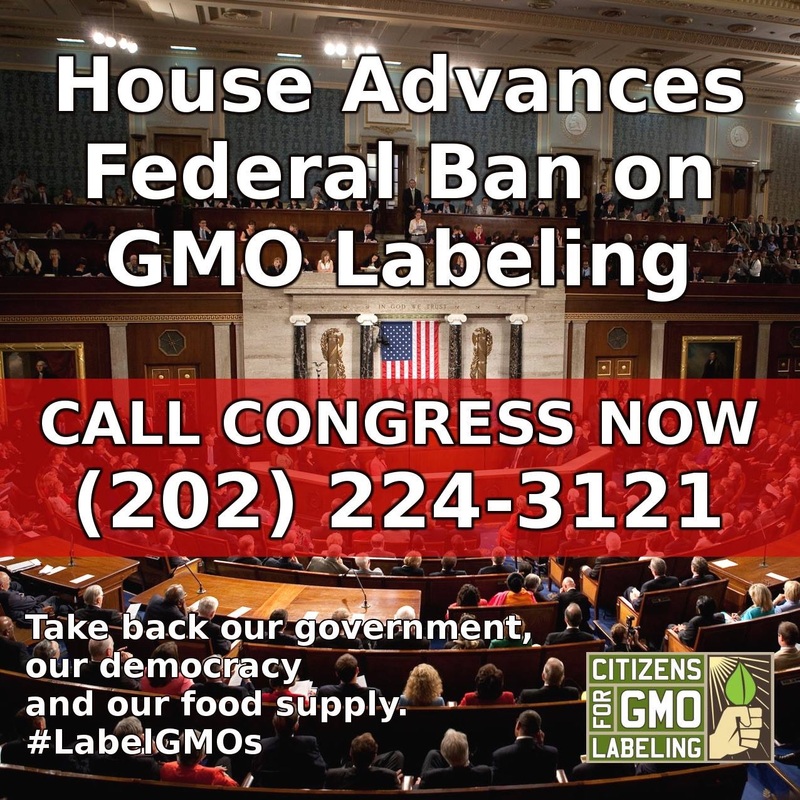 IF THIS LAW PASSES WE WILL NEVER SEE LABELS ON GMO FOODS. ALL HANDS ON DECK!